The numbers are rating and rating deviation respectively. A higher rating represents higher skill. Killing low rated players over and over won't improve the rating for example. Killing players of relatively equal or greater skill improves rating. 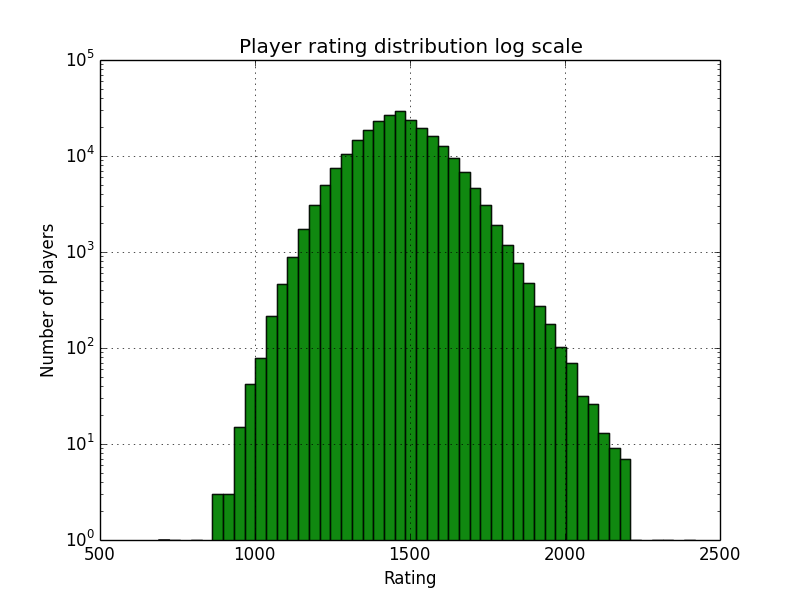 The rating deviation, RD, together with the rating represent the interval where the true skill of the player is. For example for a player with rating 1800 and RD of 100, we can be 95% confident that his real strength is in the interval from 1600 to 2000. We want RD to be small in order to be more specific, but at the same time we want it to be large enough, so that ratings converge fast to values close to the true skill of the player. Rank and rating are different. Rank is simply the number of players that have a better rating than the player being ranked. Find player ratings, comma separated list, prefix search, not case sensitive. Find player rank, one exact name, not case sensitive. Find the odds of two players fighting each other. Two exact names, not case sensitive. Get top 1000 for a specific server or global. One exact server (world) name, not case sensitive. Active players ranked: 80661. Average rating: 1535. Last update 74 seconds ago. The list of top players is full of hackers and stat padders. It should be easy to filter them, why don't you do it? Every system can be gamed and I won't play internet police. I want you to realize that those players are a minority and their effect on the overall rankings is insignificant. I'll add some details that should make them stand out more (battle rank, minutes played). You are encouraged to report cheaters to Sony, because usually the means to cheat this leaderboard require you to break ingame rules and what Sony calls "the spirit of the Game". Check out their EULA and Terms of Service. Also get in contact with the ingame admins when they announce their presence. I've had it in mind ever since I started playing, which was as soon as the game had its official release. I took the chance to learn a few things and while I was sceptical at first, the results satisfy me, so I decided to publish them. Please don't take any numbers too seriously, there are many ways to play the game. Raising your rating by 100 points probably isn't worth the pain you may have to endure. What about adding feature X? I won't go into detail what will and won't be implemented, as it may change at any time. If I add something interesting, I'll announce it in the planetside reddit - /r/planetside. While some players have multiple characters on different servers, the majority of the players will never meet. Many won't meet even when they play on the same server. We'll have to trust some factors that are out of our hands on this one. SOE is balancing the populations on the servers by rotating the recommended severs from time to time. This should in theory make the skill averages of the different servers the same. Another point is that players keep correcting their play style from feedback that comes from a variety of shared sources (reddit, forums, patch notes, ranklists), not just ingame. Some play styles are more rewarding than others. The top players will use whatever gives them the most advantage. To compete with them you will have to challenge them directly (or players in the same rating range). How you do that is up to you. It can be with vehicles or a group of 3 friends with decimators. You could try to replicate their strategy if it seems so easy. All kills award rating, but if your opponent's rating is low compared to yours (think for example 200 points difference) you will win a point or even just a fraction of a point. Your opponent won't lose much rating either, because as far as the model is concerned, everything worked out as expected. The better player won. If however the low ranked player wins, his prize will be much bigger and the penalty for the high ranked player will be much bigger. How are you rating players? I'm using the glicko-2 rating system, which is self correcting. 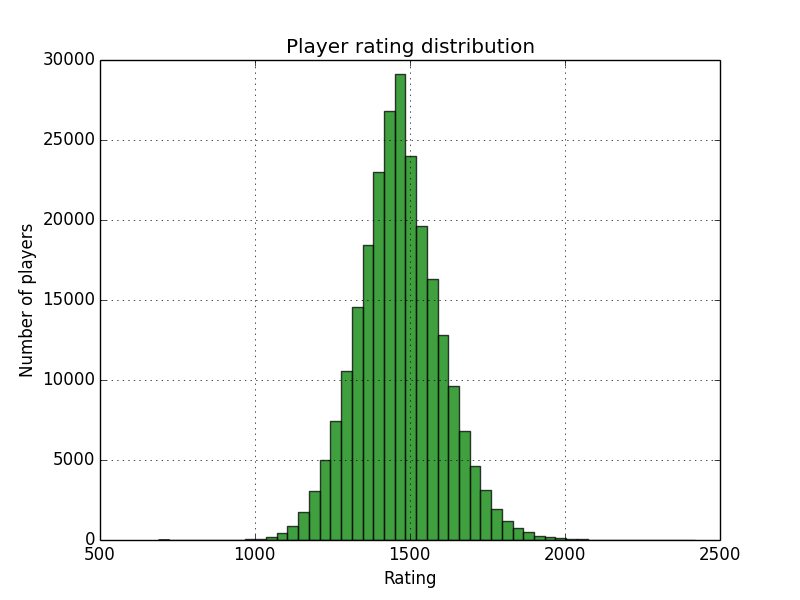 New players start out with 1500 rating and 100 rating deviation. The relatively high rating deviation allows them to move fast up or down the ladder for a while. Soon enough they find a spot where they perform consistently and the deviation starts to drop. There is ratings inflation among the highest rated players. It was expected, it's hard to rate accurately players that never lose. The model correctly places those players above everyone else, so I'm still happy. Ratings can't grow indefinetely by killing a lower rated player, so it's interesting to see where the roof is. Inactive players can be dealt with in many ways, but all have disadvantages. Most implementations assign an inactive player a provisional status and he's excluded from ranklists. I decided to delete them instead. It's easy to get your rating back, because as soon you come back, you will get ranked again. There's no need to grind or invest a lot of time, it's enough to win against some strong players. This loses us historical achievments, but they aren't too meaningful, because the game, the player base and ratings are always moving. Comparing a current rating with one from the past will be nothing but misleading. I've never considered making separate lists for vehicle-only or knife-only players. I wanted to create an overview, a summary of the playerbase, not an in-depth analysis. I expected the top players to be vehicle-only, the game was designed that way. It seems this is slowly changing in favor of infantry players. A player can't be summarized by a few numbers, I'm not pretending to have achieved such a thing. Use the data to help you make up your mind about a player. A person is multidimensional, some are better at aim, others at strategy and patience, others at teamplay, others at trashtalking and drama. Sadly the SOE census doesn't show that much. Hopefully in the future teams (squads, platoons, alliances of the people shooting eachother) will appear in the census and someone will make yet another ranklist. Support players are not accurately represented at all. This includes squad/platoon leaders, people that play for objectives (generators, capturing bases), medics, drivers and pilots that give all shots to their gunners, people with playstyles that generate them only assists. Even if events from those players were available in the census, I can't imagine incorporating them in a way that makes sense. It would be easy to create separate leaderboards for support players, but that won't clarify how they fit in the grand scheme of things. Maybe someone will find a way. I hope I've set some foundation that will inspire others. Note this isn't implemented, it's just a mental exercise. What does it mean to ressurect a player? Killing someone makes your team stronger because there's one less opponent and because you gained some XP. Ressurecting someone makes your team stronger because there's one more ally and because you gained some XP. It doesn't take away the XP from the killer. So at first glance they are pretty much the same, at least for the guy doing the killng/ressurecting. Who to penalize and who to reward? I'd do it like this: a player gets killed, which awards rating to the killer and penalizes the guy that died. A medic comes and resurrects, this reverts the previous change in ratings and instead awards the medic and penalizes the killer. The guy that died gets away with no rating loss, no XP. The medic wins rating and XP, the killer loses rating and wins XP, he got outplayed by a medic, because he gave away his position, lost ammo, lost grenades, lost health and shields, lost potential. But what if the resurrected guy gets killed again? Should the medic keep his rating reward? Probably not, they still get away with XP. I love that, so I had to mention it. Never forget. Might be interesting to newer players. TR version, but the rest are similar enough. Flash Renegade shotgun; headshot required? I forgot something? tell me.